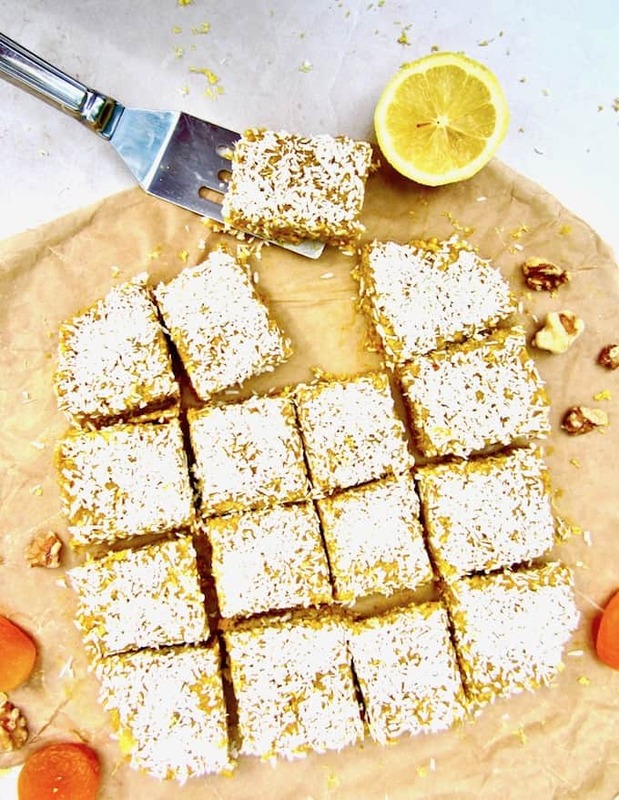 These No Bake Apricot Turmeric Lemon Bars have a lovely citrusy, tangy flavor and make a super healthy sugar free, vegan and gluten free snack! They are an energizing powerhouse filled with fiber, protein, antioxidants and anti-inflammatory properties. It’s time for a no bake recipe, because well, it’s summer and it’s hot and who really wants to turn on the oven more than necessary, right? Because I know many of you reading this blog are sugar free, I wanted to make a sugar free snack recipe that still feels like a nice treat. 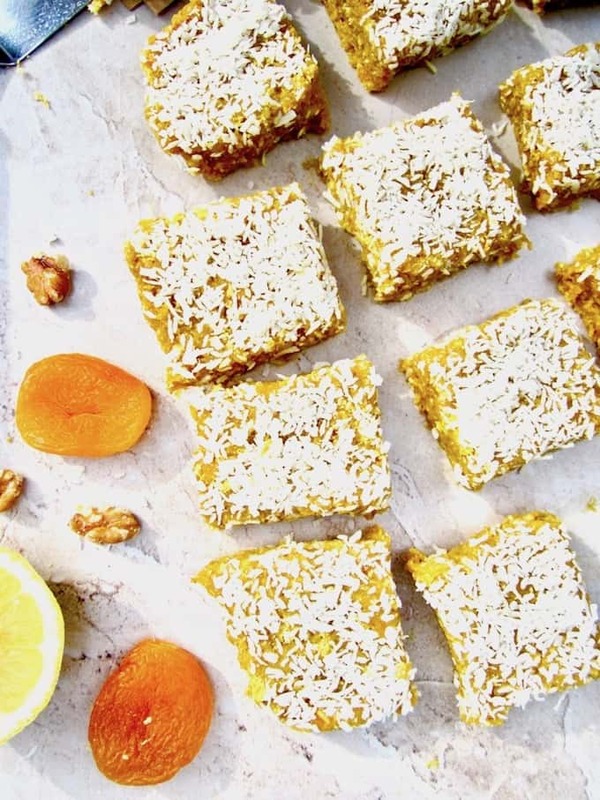 While this recipe isn’t sweet, it is tangy and tart, making it a great afternoon snack or as part of your breakfast without causing blood sugar spikes. So if you’re a citrusy, tangy-treat lovin’ kinda person, this recipe is for you! If you do want to make these sweeter, you could add a little stevia to keep it sugar free or substitute maple, agave or date syrup in place of the soaking water in the recipe. Alternatively, you could replace the apricots with dates (or sub half dates/half apricots) to really sweeten these up. 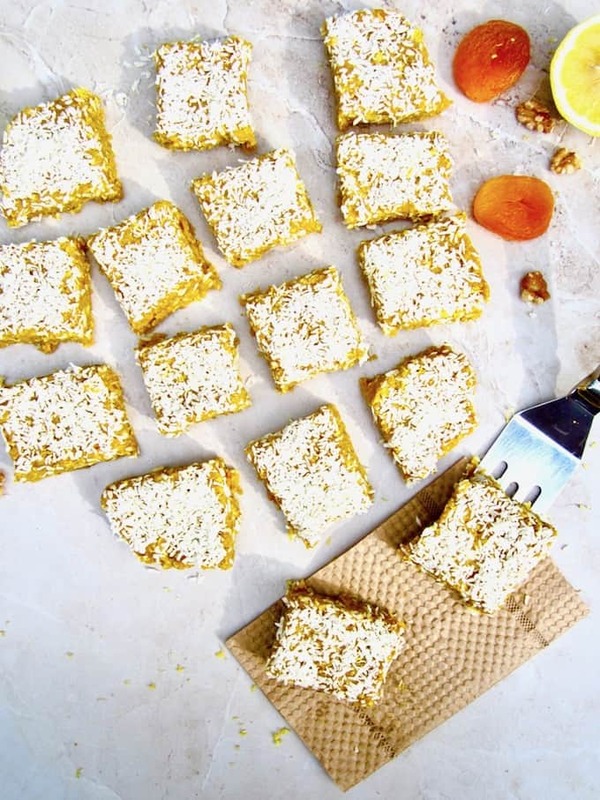 I tweaked this recipe from the blog Natalie’s Health, and she uses all dates (no apricots) – which really made for a delicious, naturally sweet dessert or snack that were a huge hit when I made them for my family and for an afternoon event I catered when I was in Hawai’i. With the fresh lemon juice and lemon zest in this recipe, you’re really getting a clean citrusy taste, combined with the unique, enriching flavor of turmeric – a spice known to boost immunity and fight inflammation, along with a whole array of other benefits. Did you know that also adding in at least a pinch of black pepper with turmeric helps activate the main health component of turmeric – called curcumin – and therefore you more easily absorb turmeric’s benefits into your body? Therefore I added just a pinch of pepper in this recipe. You can’t taste it, it’s just there to enhance turmeric’s powerhouse of benefits! And what about the dried apricots? Dried apricots are filled with dietary fiber, potassium, iron and antioxidants. Chia and walnuts are also rich with fiber, while walnuts and oats are a great source of plant based protein. I hope you enjoy this easy, no bake, sugar free tangy treat! Soak the dried apricots in hot water for about 5 - 10 minutes. When they've softened, drain the water BUT RESERVE 1 Tbsp of the water. Place the apricots in the food processor. Add all the other ingredients to the food processor except the reserved water, 1 tsp of the lemon zest, coconut and any other toppings you may be including. Blend until the mixture turns into a dough-like consistency. If the mixture is too dry, add the reserved 1 Tbsp of soaking water. Top with coconut, remaining 1 tsp of lemon zest and any other desired toppings. Refrigerate at least 2 - 3 hours before serving to firm up. The end result is meant to be soft and sticky. Store covered in the refrigerator. Perfect snack for hot summer days. Love the combo. Need to try it. It is a great one on a hot day! Thanks Jasmin, let me know if you try it! I love the combination of flavors you used! And it's awesome you added anti-inflammatory turmeric. I am trying to incorporate it more into my diet. 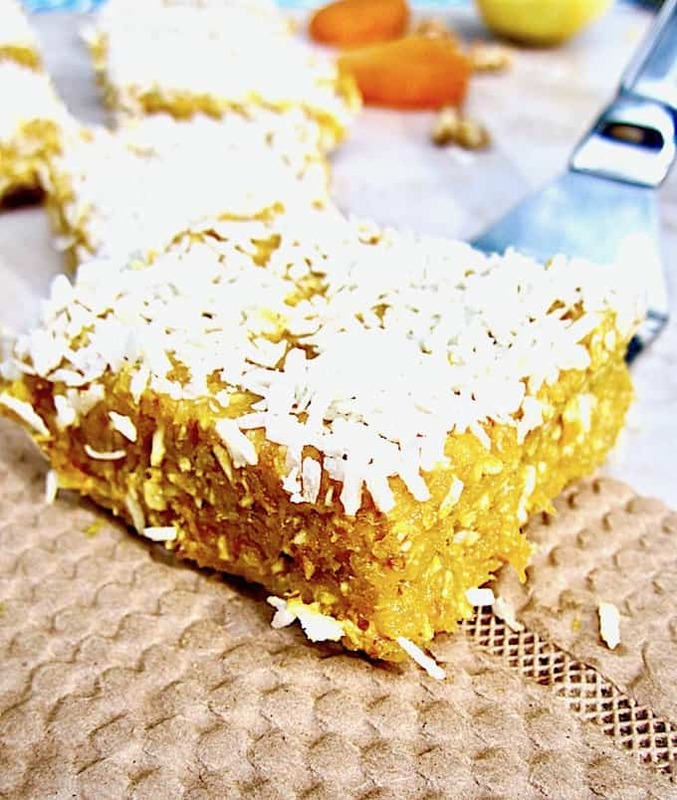 15 mins to delicious NO COOK healthful bars? I'm in!! Thank you for sharing! A healthy dessert/snack! I too love the turmeric addition, as it has so many benefits. Bookmarking this now! Awesome Matt, cheers! :-) Yes, turmeric is an amazing plant!